Specializing in fine decorative painting, faux painting, faux finishes andoriginal murals. 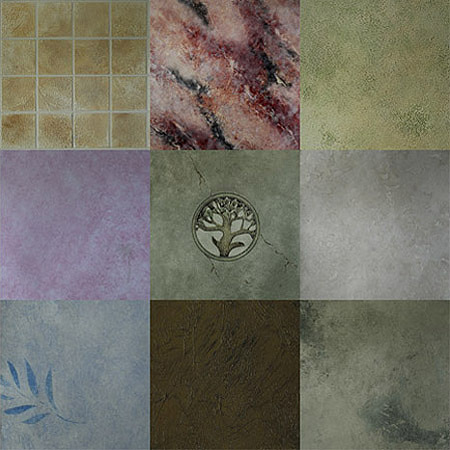 I have selected a sampler of faux finishes for you to view. I can make a custom sample board designed specifically for you. After meeting you in your home I will develop a board that meets your color and style needs. These samples are poster board size (24”x36”) so they give you a good idea of what your room will look like when it is finished. Since faux finishes deal with color interaction you will find that they change depending on the light they are in. They will look different from daylight to night lighting and from a sunny day to a rainy day. They will even differ depending on where they are hung in the room. The sample board process allows me to tweak the colors so that the final work looks great in all lighting scenarios.